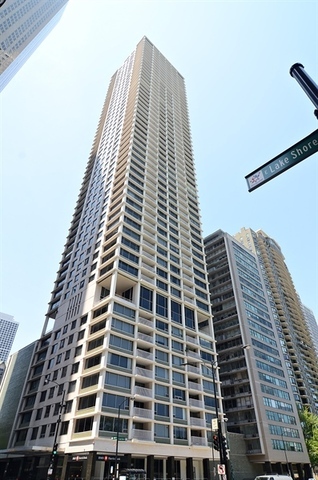 Great Gold Coast value in this upscale building, perfectly located with Oak Street, Chicago's Magnificent Mile and the lakefront out your front door. Spacious, 2100 sf, beautifully appointed home flooded with sun and skyline views from 2 sides of windows. The rooms are oversized with 9' ceilings and can accommodate large furniture and art and perfect for entertaining. The kitchen features an eat-in area and window with amazing storage. The living room is 30' long off a formal dining room. Custom closets and finishes throughout the home. This building is all about service with two 24-hour doormen and on-site management. A major rehab was recently completed of all the common areas to feel like a newer building, including a top floor indoor pool, party room w/outfitted kitchen, fitness room w/showers, library, card room with deck. Parking for 2 cars + reduced guest pkg. Small dogs can come too! This will feel like a home in the sky! Directions Corner of Lake Shore Dr/Michigan Ave and Oak St. Entrance on Oak St.
Property information last modified by seller on Monday, November 26, 2018, 09:05 AM CST. Information Deemed Reliable But Not Guaranteed. Unauthorized duplication, use, or linkage is prohibited. The information on this web site is for personal, non-commercial use and may not be used for any purpose other than to identify prospective properties consumers may be interested in purchasing. Monthly Payment Calculator results are for illustrative purposes only, not a financing opportunity; calculations assume a 30-year fixed-rate mortgage and do not include closing and other costs. Property Tax on NEW properties is estimated at 1.5% of Listing Price for payment calculation purposes; actual value may be higher or lower.